It’s hard to believe that Rick Astley was a massive pop singer in the 1980s because his contribution to society has largely been reduced to a moot point following the success of the ‘rick rolling’ YouTube phenomenon. Nevertheless, there is one man out there who still has respect for Astley and as he’s the nicest man in rock, it was only ever going to end with a live collaboration of epic proportions. 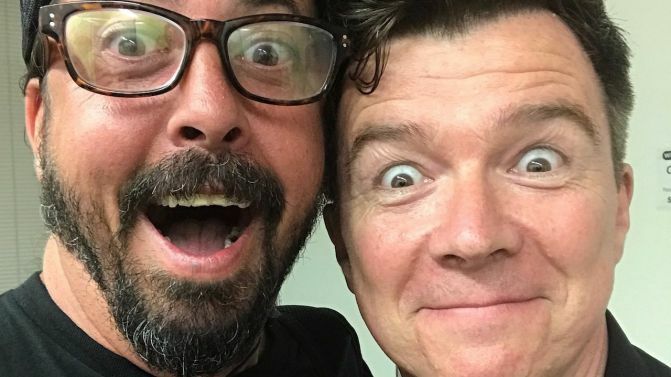 Dave Grohl was headlining the Summersonic Festival over in Japan over the weekend with the Foo Fighters and after meeting Astley briefly back stage, decided that the right course of action was to invite him to sing his 80s megahit ‘Never Gonna Give You Up’ with the band that night. Wow that was actually surprisingly good eh? Is it the same chords as Smell Like Teen Spirit though because there were a lot of similar parts in it to how that songs goes. The perfect grunge cover then I guess – maybe they should actually record it? Still not sure how appreciated it was over there because I can’t imagine Rick Astley being a big star in Japan? Maybe I’m completely wrong about though and he’s huge and this was the best thing ever for a lot of Japanese concertgoers last night. We can only assume. For more Foo Fighters, check out their tour rider from 2011. Absolutely awesome.